How to follow last years incredible Source Tags and Codes must have played considerably on ...And You Will Know Us By The Trail Of Dead's collective minds over the past 12 months, and, judging from this EP, it still is. 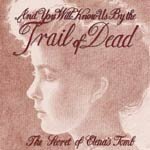 Across The Secret of Elena's Tomb, Trail of Dead prove to be, more than anything, slightly confused. The EP kicks off with Mach Schau, which starts in typical Trail of Dead fashion, with melodic guitar lines intertwining, but curiously begins to sound like a bizarre cross between Nu-Clear Sounds-era Ash, and Sonic Youth, as Conrad Keely shouts the verse, and then mutters to himself. It's hard to tell if this as an art-rock move, or if he, like the rest of us, is simply bored by the tune. The rest of the band stumble along with him, and for the first time since signing to Interscope and joining the big league, sound hopelessly lost. Thankfully, however, the EP takes a sharp upturn in quality with the two centrepieces of the record, All Saints Day and Crowning of a Heart. Both sound more akin to the already established Trail of Dead sound, with All Saints Day taking the extreme noise married with a fine melody route, that Trail of Dead have traversed so well before. It would have fitted nicely on to Source Tags and Codes, as would the dreamy Crowning of a Heart, the EP's finest track. Trademark guitar lines spiral upwards, as the cymbal-heavy drums crash across the speakers. The emphasis is again on melody, perhaps more so than any of their previous work. Of all the attempts to change their sound across the EP, this track is the most successful. The fourth, and final, new recording, Counting off the Days, is best left forgotten. Bearable until the angst-ridden wailing vocal line in the chorus, it is safe to say Trail of Dead - Acoustic Soul Bearers is not a recommended new direction. The EP also features several bonus features, the videos to Another Morning Stoner and Relative Ways, both of which hold up to repeat viewing, and final track Intelligence, an unusual, dreamy, and in parts incredibly violent, dance-tinged tune, previously available on the Another Morning Stoner single. The two standout tracks and extra features make this EP an essential purchase for anyone who counts Source Tags and Codes among their favourite albums of last year. It also provides an interesting document of a band trying to remain fresh. The results may not always be successful, but just knowing that Trail of Dead are attempting to move forward again, is certainly an encouraging sign.